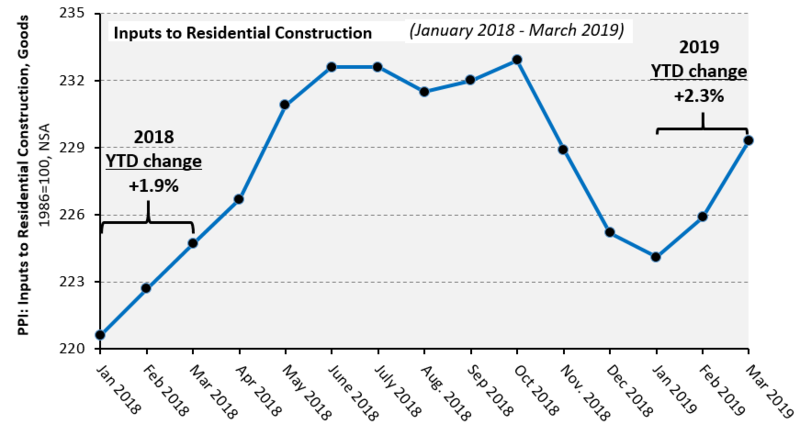 Prices paid for goods used in US residential construction increased +1.5% in March according to the latest Producer Price Index (PPI) released by the Bureau of Labor Statistics Thursday. Prices have risen more quickly thus far in 2019 than they did during the same period in 2018 and are at their highest level since last October. The average January-to-March increase since 2000 is +1.1%. The downward trend in prices paid for gypsum products continued in March, as prices declined -0.3%. Prices paid for gypsum products have fallen -8.6% and -9.8% since the start of 2019 and August 2018, respectively.